Made By EMI Records Ltd., © 1963 EMI Records Ltd.
Fourteen freshly recorded titles – including many sure-fire stage-show favourites – are featured on the two generously filled sides of this record. The Beatles have repeated the successful formula which made their first ‘Please Please Me’ LP into the fastest-selling album of 1963. Again they have set eight of their own original compositions alongside a batch of ‘personal choice; pieces selected from the recording repertoires of the American R&B artists they admire most. The first half of the session gets away to a rip-roarin’ start with John’s powerful treatment of IT WON’T BE LONG NOW. Two more Lennon/McCartney compositions follow with these two remarkably talented tunesmiths handling their own lyrics on ALL I’VE GOT TO DO and ALL MY LOVING. On the first slower number John takes the vocal lead with Paul supplying the harmony. On ALL MY LOVING Paul stands in the vocal spotlight with John and George chanting in the background. Listen to George’s superb, slightly Country and Western guitar solo, an intriguing feature of ALL MY LOVING. DON’T BOTHER ME marks the disc debut of George Harrison as a composer. It is a fairly fast number with a haunting theme tune. Behind George’s double-tracked voice the rest of the fabulous foursome create some unusual instrumental effects. Paul beats out a lean, hollow-boned rhythm from the claves, John uses a tambourine and Ringo hits out at a loose-skinned Arabian bongo (don’t ask me where he picked that up!) to pound out the on-beat percussive drive. On a fair number of previous recordings by The Beatles producer George Martin has joined the group to add suitable piano sounds to their instrumental arrangements. His keyboard contributions come a little later in this new programme but on LITTLE CHILD it is Paul McCartney who plays piano. John and Paul join forces for the vocal on this rocker and, whilst Paul was over-dubbing the piano bits. John was standing beside another microphone adding in some neatly-timed mouth-organ phrases. Ringo plays the bongos behind Paul’s solo performance, George and John switch to acoustic guitars for this track only Paul’s’ pulsating bass uses electricity. If you have read a great deal in the musical press about Merseyside’s beat basement, The Cavern, you might imagine that the cellar stompers of Liverpool would demand an all-up-tempo programme. Curiously Paul’s persuasive handling of TILL THERE WAS YOU used to go down extremely well at the club long before the Love me do days when The Beatles were frequent bill-toppers at this now-famous venue. The first half closed with another number which dates back to The Beatles’ Cavern Club period. Once an American chart-topper for a recording group called The Marvelettes, PLEAE MR. POSTMAN features a double-tracked John Lennon with George and Paul in vocal support. Chuck Berry’s ROLL OVER BEETHOVEN has been one of the most requested items at recent concert performances by The Beatles. George duets with himself on this one; the boys add to the atmosphere of active excitement by their handclapping. Paul issues forth with the invitation HOLD ME TIGHT on the fairly brisk second track of Side Two. More handclapping and energetic vocal support from John and George. The boys have an immense admiration for America’s rhythmic group The Miracles, to whom they pay tribute via their interpretation of YOU REALLY GOT A HOLD ON ME. John and George tackle the wild, relentless vocal with Paul joining them for the chorus lines. Incidentally that IS George Martin on piano this time! Observing the tremendous audience response that Ringo has been getting whenever he sings Boys, John and Paul put their heads together to pen a special new number their fierce-voiced drumming man. The result is a real raver entitled I WANNA BE YOUR MAN. The Hammond organ in the background is played by John Lennon. Though they are lesser known on our side of the Atlantic than The Crystals or The Shirelles, the American all-girl group The Donays have always commanded plenty of professional respect from The Beatles. Therefore, they witched around the lyrics of DEVIL IN HER HEART and handed this medium-paced beat offering to George Harrison, John and Paul provide the harmony with Ringo using his maracas. The final Lennon/McCartney composition of this session features a double-tracked John Lennon singing NOT A SECOND TIME. George Martin’s piano work is featured on this number and again upon the programme’s closing track MONEY. Paul describes MONEY as ‘a really big screamer’ and he recalls the numerous Cavern Club occasions when this item brought forth the same type of overwhelming response given to Twist and Shout. Much recorded by American blues merchants, MONEY has John shouting the raw lyrics with tremendous force and feeling whilst George and Paul supply the answers. MONEY makes a completely worthy climax to this knock-out programme. 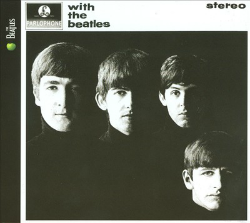 Hope it doesn’t leave you too breathless to flip back to Side One for a repeat-play session WITH THE BEATLES.